Saint Vitus Bar is a special place, and seeing a band as big as Dragonforce in a 200 cap room like that one is a unique experience. Preceding a set that saw the band cover both Journey AND Hall & Oates, the band’s iconic guitarist Herman Li was kind enough to sit down with me and answer every question that a teenage guitar nerd Matt Bacon had always wanted to ask. The next couple of pages are pretty much that, a stoked kid freaking out over the magic of one of his boyhood heroes and talking about their passions. Please don’t judge me. I hope you enjoy this as much as I did! Pretty good! This is the last show of two years of touring activities. We’re not going to take time off but we won’t be on tour! We are moving from the road to the studio! Is this the smallest club you’ve played all tour? I guess it is! You’re right! Obviously we did it yesterday too and that was a sell out. We had dedicated fans who cared about the old stuff! How does it feel to play a club like this after playing to tens of thousands at festivals? I enjoy it. The energy is totally different. Even at big festivals the people can be too far away. We don’t feel that connection. With this people can get guitars shoved in their face and get a unique experience. So which festivals do you not feel a good connection at? We did Ozzfest the first time in America and that felt weird because the more expensive tickets got you closer whereas in European festivals you can go wherever you want. That was weird. We got used to it after a while but you’d rather people go to the front if they just want to do that. You as a musician were hugely influential on me and a bunch of people I grew up with and that generation of guitar player is growing up. Do you see that looking at the metal world? 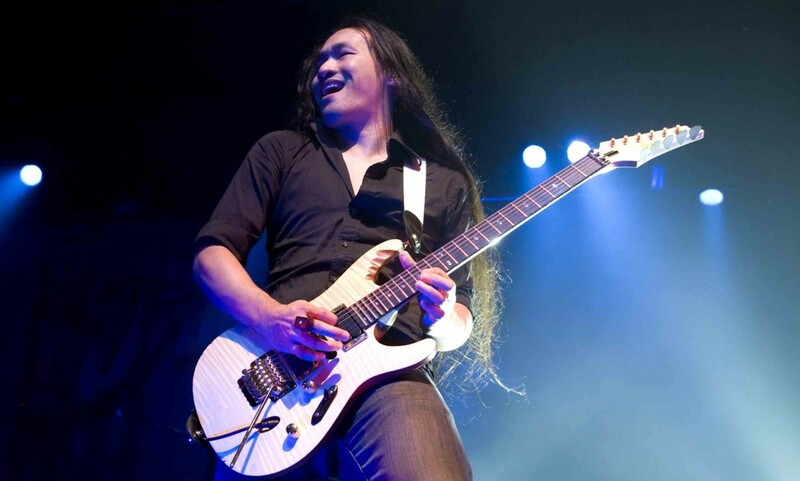 I have met a lot of people in current bands that got into guitar and metal through Dragonforce. I’ve met guys that are touring who used to listen to us and I get to do the same meeting my heroes. How does it feel to be this modern age guitar god? I wouldn’t say we’re that. For me, the way I approach the guitar some people like it some people absolutely hate it. I never look at it that way. I have good days and bad days. I do my weird things that some people think are really cool and others think it’s horrible. What is the appeal of Dragonforce to you? I enjoy what I’m doing, we have fun playing! We are a bit more professional and careful now. Before we didn’t really care now we think twice. I am always trying to improve the show. I want to have things run smoother and be more exciting, it’s not just doing another show. Even if you are in the same venue you need to improve it. What does that mean for the future of Dragonforce performances? Do you have a direction? It’s hard to say, we try to get better with everything in every way. You have to do shows to come up with ideas accidentally and you develop it as you go along. It’s hard to think of things as you sit in your room. For example the trampoline idea came from jumping off risers. We have ideas for ramps and stuff too but we don’t want to keep doing the same thing so we are changing the show a little bit. They were rehearsing something earlier, but who knows! The guys in the band do whatever they want and just want to have fun! Something I talked to Fred about when I interviewed him at Hellfest was that for better or for worse your career has been defined by Through The Fire And the Flames, how does that feel to you? Some bands have a connection to some song that they can never shake and they always have to play it last. Some bands just have to play those songs and I accepted this for Dragonforce quite a few years ago. What I like about these shows at Saint Vitus is that everyone knows our old songs and we can do some rarities. We almost don’t want to play Through The Fire And The Flames! Do you want to do more club shows like this? We did one in London like this a few years ago. We do them randomly in different places. But there is no desire to do a club tour? I like them and they are fun but we’re not doing the full show that we can do in these clubs. We’ve only got like one riser. We like to do crazy stuff like playing underwater! That was one of my favorite things you’ve ever done! Did you come up with that on the spot? Back in 2013 maybe we did the first 70,000 Tons of Metal Cruise, or at least it was our first appearance there. When I saw everyone getting drunk I didn’t understand why no one was playing in there! I thought of it on the cruise but I had no preparation so when I did the underwater guitar on the Full Metal Cruise I had thought about that idea and set up my equipment so I could make that happen. Then I had a new idea on the last cruise we did but the storm ruined our show, we couldn’t play on the deck. I had a guitar custom built for it. I have a water guitar that sits in the case until next time! When I grew up learning to play guitar it was the 80s guys like Vai and Gilbert who were my favorites and were doing interesting things. They were trying to push the boundaries and it was fun. That fun side of things never left me. Before the pool stuff I was crowdsurfing during solos. I want to see people going beyond the minimum requirement of going onstage and playing. I wanted to get into your thing for fast cars… when did that start? I don’t know. I used to have a remote control Porsche when I was a id and I thought it was cool to get one! You don’t buy a sports car to drive on the street and follow the law, you’ve got to drive fast! I used to take lessons from a professional race car driver in exchange for guitar lessons. Just for fun. It was like learning martial arts. I’m never going to have a racing career though! Do you see a link between driving and martial arts and music? It’s all in the brain. I like skillful things that you have to be good calm and controlled to execute. The driving fast thing – definitely. There is that adrenaline in it. You’re on edge and like in martial arts there is a competitive side to it. Do you have other hobbies like that? I’m into computers too. I like to keep myself busy. I like to learn how to fix cars too. My car is just a stock though, I don’t trick it out. You learn the physics of driving and the machinery though. Playing the guitar I learned to fix my guitar, the same thing goes for cars or computers. I used to work in networking before I was professional musician! Well you have to go into the finery. You can’t just look at the surface of it. You need to have fingers in everything to fully express yourself – like the videos we did for this album. It was all us, we learned how to do it! Music is kind of a weird thing for me. I really like it but it’s the only part of my life that’s illogical. I’m very logical I calculate everything and try to do it perfectly. I like things to be clear. But there’s n such thing as perfect music. Playing perfect notes isn’t always good! Maybe it balances the rest of my life! Playing wrong notes or whatever doesn’t mean anything because there is no such thing as wrong! So you appreciate being allowed to be wrong? Yes! There’s no such thing as ‘I’m better than you” What is better? Selling records? Connecting with the audience? Some guy can blow you away with two notes. Human emotion is weird, we lose all our logic. I never thought about it but it might be the only thing that balances my other part. Does that mean you feel a lot of pressure to be right? Probably music is the only place I don’t feel that. But if you put the other stuff into it yeah. Like technical stuff, setting up the gear. For the last few shows we didn’t have a guitar tech so I’ve been setting it up but that’s just the technical part. Any final words of wisdom for me? Anyone that continues trying to improve themselves will know more about themselves! Doing interviews I discover something about myself too! The Best Unsigned Band in America is…? Help Us Decide!